Celebration. The best work for fraternity during the precedent year. Abolition of standing armies. The formation and spreading of peace congresses. Conferring the greatest benefit on (hu)mankind. These where the elements that Alfred Nobel had in his mind when he imagined a peace prize. These elements combined in extraordinary manners should embody Alfred Nobel´s spirit every year. Colombia. A Latin American nation with 45 million inhabitants and infamous for a 50 year long armed conflict that internally displaced around seven million people and did force approximately half that number to live in exile. With one foot in the dichotomies of the cold war and the other in the terrain of progress, Colombians now desperately call to put an end to the longest raging war of the Americas. President Juan Manuel Santos and guerrilla leader Timoleón Jiménez – “Timochenko” – are currently following this calling. The protracted confrontations between the state armed forces (supported by paramilitary groups, now mostly demobilized) and communist guerrillas, has kept Colombia hostage of cycles of political violence. Today, Colombia’s society is very unequal, with people living in rural areas being the most vulnerable –not only due to the distresses of poverty and lack of access to basic services– but also due to the armed conflict (inequality is at the same time cause and consequence of the armed conflict). In stark contrast to this, Colombia is also home to thriving lively cities where the elites and a growing middle class can enjoy the pleasures of an educated stimulating life (although cities also experience great socio-economic inequalities). Yet, irrespective of social status, all Colombian citizens have had to live in a country at war for generations. In this context, the peace process that started in 2012 between the government and the FARC guerrilla is being interpreted in many different ways within the Colombian society. While some sectors support the negotiations as means to an enduring ceasefire, others –following the discourse of former Colombian president Uribe– have adopted the post-9/11 language of terrorism and do not see as to why the leftist guerrilla group, now seen as a terrorist organization, deserves of any rights to negotiate their position, and rather cherish for continuing the armed struggle until victory by battle is achieved. During this very long and complex conflict with equally “complex political victims”, to recall Erika Bouris, very few can claim innocence. Take the Colombian State as an example. It holds a legal right to exercise force against belligerent organizations. However, due to historic alliances with paramilitary groups and the state’s incapacity to bring equality and dignifying life conditions to all its citizens, resulted motivating the very uprising in arms of revolutionary groups, which in essence began as benign peasant movements fighting for their rights to land. Moreover, the state forces have used methods like torture, selective killings and forced disappearing to fight communism in Colombia since the 1960s. While other Latin American countries where experiencing dictatorial governments, Colombia kept a democracy with a long lasting counterinsurgency campaign as center of its politics. Today´s FARC combatants are no uncontaminated idealists either. Decades of war drove the leftist communist movement to illegal and very violent ways of financing their political struggle: drug trafficking, kidnapping for ransom (mostly of wealthy citizens), selective killings, taking over of political control over entire rural municipalities by force, and use of child soldiers. Means that various sectors of the Colombian society struggle to forget. As we can see, war in Colombia has badly degraded over time. A fact to showcase this is that the number of civilians affected by the armed conflict surpasses that of combatants. Over the past half century eventually, the antipodal dynamics of the armed conflict have led to an extreme polarization of Colombian citizens, the construction of ideas of enemies within the collective imaginary and have produced numerous deceptive justifications for the use of violence in all sectors. However, divisions among the population go much further beyond agreeing or not with guerrillas. Colombian politics hold debates about many other pressing issues. A recent report by the National Centre of Historic Memory suggests that much of the elites and upper middle class in Colombia show less support or concern for the peace process because war has mainly affected the unprivileged. Therefore, they cannot easily see the importance of bringing the war to an end. 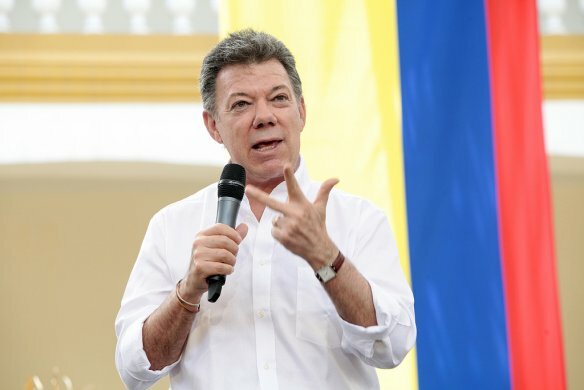 But despite vigorous opposition to the peace process, especially from right-wing political groups within Colombia, Santos’ government and the FARC have managed to take the negotiation process to unprecedented stages. Not only have they agreed on an agenda to address issues as structural and transversal as land distribution, drug trafficking, and victims, but they have also created a transitional justice formula that could work in practice; i.e. a deal that allows for demobilization while not granting impunity. This was achieved by setting down basic principles on the rights of victims to truth, justice, reparations and guarantees of non-repetition. More commendable even; the negotiating parties managed to stay at the table despite various armed attacks committed by both sides jeopardizing the delicate peace process. To state the obvious, a definitive cease-fire will definitely aid the cause. It would lessen the humanitarian crisis lived by the inhabitants of hard conflict zones. However both parties have yet to agree upon this. They have already arrived at temporal cease-fires, fragile to offensives by combatants in the terrain. In this sense, getting the Nobel peace prize would definitely back and boost this process as an attempt of a negotiated solution to the Colombian conflict. It would send a clear message to opponents and the very parts to the conflict, in the way of “this is the right way”, or “it is desirable to end an armed confrontation by dialogue”, even this particular generation spanning, grotesque, armed confrontation. Also, it would show support and put some important international pressure on the parties to comply with their commitments to reach the demobilization phase by March 2016 and sign up an accord that states the end of the armed conflict, as was recently agreed upon by the parties. However, let us not forget that Juan Manuel Santos and Timoleón Jiménez have essentially been military enemies. Both have justified violence as means to “peace” both before and during the current process. The reason they are in a negotiation now is the respective failure of the opposing parties to wrestle the other side to the ground militarily, to eradicate the enemy physically and/or politically. Both parties justify the use of strategic violence as means to achieve their political ideals. They have been doing so for over 50 years. The current and previous governments could not defeat the FARC by military means as they intended, but they managed to significantly reduce guerrilla forces in numbers by a great increase in the state armed forces budget as well as financial and technical support from the United States government. President Santos claims that this is why they can now bring the opposing party to join the negotiating table. Unquestionably, a final cease-fire, and a demobilization of the FARC opens up enormous possibilities for new cultures of peace within Colombian society and could allow for conflicts to be addressed in nonviolent ways. However, for now it is perhaps premature to say that the process has come to disbarment or the abolition of the idea of diminishing the enemy. Having a dream is certainly noble, especially when its realization could change the lives of millions for the better. Working courageously towards it despite great opposition is virtuous. But, do these two old-timer army commanders embody what the Nobel peace prize is about? Can we see the extraordinary attitudes imagined by Alfred Nobel in their actions? Is their handshake fraternal enough for Nobel-like celebration? Unfortunately, I do not think so. It is perhaps valuable to use this year prize speculations’ to reflect upon what kind of peace is the one we strive for. What is happening in Colombia now is the making of a cease-fire between parties that have justified the use of violence for decades. And –much less but still– do it today whenever they need strategic positioning within the frame of the peace process. Notwithstanding this, since its very beginning the peace process has brought a new kind of “esthetic pacifism”, as Wolfgang Sützl would say, surprising Colombians with new words and images of old enemies having a dialogue and even sometimes shaking hands. Making us all imagine that despite our differences we might be able to live together. Against all the odds, the peace process has become a platform for the expression of many ideas of peace that are as diverse as the Colombian population. As such, it is a welcome bliss of actual peace. But I would suggest that we rather reserve Nobel celebrations for nonviolent political actors who resist violence. That we prize extraordinary people who allow for the construction of more respectful societies, and with their daily actions motivate fraternity in us. That we shed Nobel light on those who despite sophisticated justifications for violence, make a choice for radical nonviolence. Most certainly, what Santos and Jiménez are doing is noble and will change the course of Colombia for the better. I strongly hope it does, and receiving a peace prize would probably facilitate things for them. However, it is rather contentious whether two men who have chosen standing armies as means to bring their enemy to the negotiation table embody the Nobel spirit of peace.